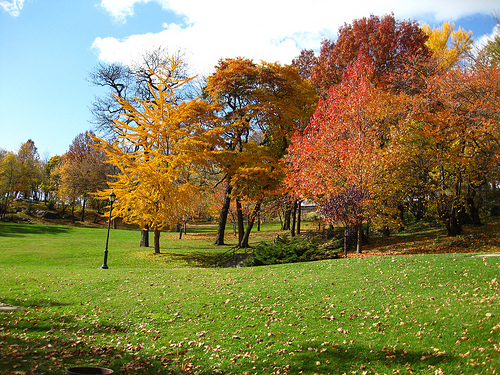 St. Nicholas Park is located at the intersection of two Harlem neighborhoods – Hamilton Heights and Manhattanville. The nearly 23-acre park is situated between 128th and 141st Streets and St. Nicholas Avenue and St. Nicholas Terrace. Some of the land for the park was acquired upon the condemnation of the Croton Aqueduct in 1895, and the additional property was assembled between 1900 and 1909, which included the area at 128th Street known as “The Point of Rocks,” where General George Washington had positioned himself during the Battle of Harlem Heights in 1776. The name of the park is taken from adjacent streets St. Nicholas Terrace to the west and St. Nicholas Avenue to the east. These streets honor New Amsterdam patron saint St. Nicholas of Myra, whose likeness adorned the masthead of the New Netherland ship that brought the first Dutch settlers to New Amsterdam, and who is the inspiration for Father Christmas or Santa Claus. Landscape architect and Parks Commissioner Samuel Parsons designed the park himself. The park was built on a rugged mass of Manhattan schist following the steep and irregular topography of northern Manhattan. The imposing and Gothic-inspired City College of New York campus overlooks the park. Hamilton Grange, the summer home of our first Secretary of the Treasury and one of the nation’s Founding Fathers, Alexander Hamilton, was moved from nearby Convent Avenue into the park in 2008. Facilities: Basketball courts, dog runs, playgrounds, barbecue area, and handball courts. Now step inside the City College of New York, the “Poor man’s Harvard” campus and marvel at some of New York City’s beautiful Gothic-designed buildings. Then head on down to Harlem Stage Gatehouse for an intimate performing space in the landmarked Croton Aqueduct water system. Transportation: Bus—M3, M4, M7, M11, M116. Subway—A, B, C, D to 110th, 116th, 125th, 135th, and 145th Sts. Detailed descriptions which include uncommonly known cultural and historical facts, websites, phone numbers, hours of operation, prices, menus and hyperlinks that link entries and lead to websites for additional historical and factual information. I can only subscribe to what other people already have told about the guide. It’s just great that I can read a place description, actually give a call its manager, find it on a map and even hook up on its Twitter channel to keep my eye on it. Very smart! 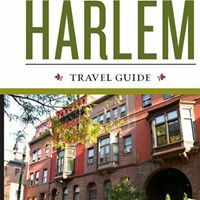 Download the free Sutro World @ www.sutromedia.com/world and purchase the Harlem Travel Guide today for $2.99! The jerk chicken with potatoes and salad and Cedric French Bistro in Harlem. HARLEM — Cedric Lecendre was reluctant to lend his name to the small French bistro that he opened on St. Nicholas Avenue with co-owner Fabrizio Khanlari and managing partner Dard Coaxum last month. “It’s a bit of pressure. It’s my name on the door,” Lecendre said of his first ownership effort. But he comes from the restaurant business — his family owns Le Bilboquet on the Upper East Side. The three friends decided that having Lecendre’s name adorn the restaurant was necessary to create the type of casual neighborhood eatery that was their ultimate goal. “I’m a believer in the personal touch. Our guests come in and ask for Cedric,” said Khanlari, who has operated restaurants in London. And they usually do. Located in the space formerly occupied by Mojo, Cedric, located on St. Nicholas Avenue and 119th Street, may be the most talked-about new restaurant in Harlem since celebrity chef Marcus Samuelsson opened Red Rooster on Lenox Avenue. The three friends collaborated on everything from the layout and decorations to the music playing at just the right level in the background. Since opening, the restaurant has seen its share of celebrities, including actors Samuel L. Jackson, Chris Noth and rapper NaS. But in an attempt to keep the neighborhood vibe, reservations are not taken. Prices range from $16 to $25 for an entree and average $10 for an appetizer. Servings are generous. 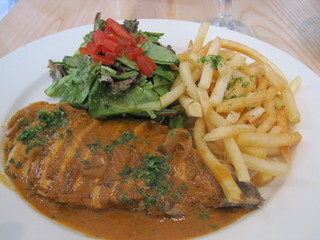 Although the restaurant is a French Bistro, there are still dishes like fish and chips and jerk chicken on the menu. “You are not going to see fish and chips in a Paris bistro, but we had to do dishes in Harlem that would satisfy the locals,” said Khanlari. In a tribute to the diversity of the neighborhood, some of the most popular dishes are the curried mussels and the tuna tartar with avocado. Most nights, there’s a mix of people of different races and ages filling the 45-seat venue. Even in light of Harlem’s recent restaurant boom, the three see opportunity. “The Red Rooster has helped to make Harlem a destination. People are now looking for new restaurants to visit,” said Coaxum. Harlem is a neighborhood that is “growing toward a better future,” added Lecendre. He said consistency is a problem at many of the Harlem restaurants he’s visited, while Khanlari said much of the food just hasn’t been very tasty. With dishes liked grilled salmon with ratatouille, red beet salad with goat cheese and pan seared duck breast with cherry sauce, the goal is to offer consistently good food with a good environment. “We put a lot of effort into this,” said Khanlari. Khanlari, Coaxum and Lecendre say they hope to create a restaurant that is good enough to give them enough cache and capital to open another venture in Harlem. “The way things are turning out, I couldn’t be happier to have my name on the door,” said Lecendre.